Network Migration Workbook EOL: Now only $149.95 !!! Super Monster Cyber Whatever Makes You Happy Sale! The Network Migration Workbook has been going strong since 2008. The Second Edition came out in 2012 and covers the last gasp of Small Business Server. This book is 530 pages PLUS you get access to all the content electronically, including a series of 200+ page checklists for performing Zero Downtime Migrations. While we've sold the book around the SBS product, it's really a great guide to migrating ANY Windows server. As you move clients off the last SBS servers and onto cloud services or stand-alone servers, you will save hundreds of hours with this book. Really. Find out LOTS more details here: www.networkmigrationworkbook.com. Check out the Table of Contents. Also see a summary of each chapter at www.networkmigrationworkbook.com. This book will be a resource you will use VERY heavily in the next year as you migrate clients off of SBS. Then you'll take the book apart and keep using the templates, checklists, and FORMS for the rest of your career. The extra documentation forms and checklists are worth the full price of $299.95 - really. Now - until end of life - you get it all for just $149.95. Is that one hour of labor for you or maybe two hours? No matter what it is, it's a huge savings. Readers Love It . . .
“And I realized that . . . for $249, Karl's book was going to save me that amount of hours and money as it would REMIND me of all the passwords, settings, configurations, and documentation that my own network is in dire need of myself. Is it expensive in this day and age? I'm a cheap bean counter. Yes it's expensive. Can I justify the cost because I myself personally see where it's going to save me time, remind me of the settings, configurations, and all the other potential places where I need to document stuff needed for migrations in my own network? You betcha. "Awesome. Has to be the BEST investment I made in my business in the last 18 months. Better still, updates get made available so I don't have to keep buying it." Really . . . they do . . .
"Karl and Manuel have taken a very complex process and broken it down into comprehensive series of relatively simple tasks that most any competent technician should be able to follow. As the owner of the business, I can't tell you how valuable that is to me! Read the entire book, cover to cover - Twice! Don't just skip to the checklists. Then proceed with confidence that you CAN complete the migration efficiently, effectively and most important, Profitably." "The 2008 Migration Checklist has enabled us to deliver better projects by helping us better define deliverables, create more efficient workflow through the project, increase our project profitability and enhance the client satisfaction level. This is a step by step guide that will take you through every aspect of migration projects like defining the project scope, documenting deliverables, creating step by step processes to ensure your projects are a successful, assuring you're profitable and exceeding the client's expectations every time! This is a 'must have' guide for ANY technical service company"
"Karl and Manuel have done an excellent job compiling their business and technical procedures into a series of checklists. The checklists are awesome. The beauty of this book though, is the fact that they also took the time to explain in great depth why things are done in the order they are done. The explanations found in the chapters that precede the actual checklists should be mandatory reading for anyone aspiring to build their own I.T. business and anyone employed in the industry." "This book is quite amazing. Someone telling you not only how to get it done technically, but providing the details of business rules and procedures that only come through blood, sweat and tears to make it all happen. Information normally never shared, especially with potential competitors! Karl and Manuel have spilled it all right down to quoting jobs and detailed checklists for a step by step approach in a typical network migration. 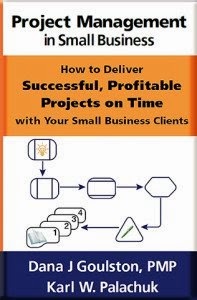 So if you are professionally involved in delivering small business IT solutions this book is a must have not only for benchmarking your own practices and performance but for some great detailed "how-to" technical information. The lists are right up-to-date for Microsoft SBS 2008as well as covering SBS2003. Great work and I hope these guys stay in business long enough to put out more books like this! Pays for itself on your next network migration." "Karl Palachuk has built his business around the idea that procedural approaches to delivering services will result in higher quality, and he's right. It's the eMyth at work, and this book is the result of that. Karl provides for you the procedures. Every one of them. His entire process for performing migrations, ensuring you have every bit of detail you need to perform work as his team does. The level of detail provided here is extraordinary. I handed the book to my engineers, who were blown away by the ability to pick up the book and start working with it right away. Consulting services like this are invaluable -- and Karl makes it available in a single, easy to use package. "As anyone who has read the e-Myth books knows, the key to a successful business is standardization (that's how all the big retail franchises work). The key to standardization is documentation. Karl P. first gave the SMB IT consultant space the framework for that with his Network Documentation book a few years ago. The Network Migration Workbook not only includes updated forms from that book plus detailed information on how to plan and execute a profitable migration project conducted solely during business hours and with zero downtime to the customer's production environment. Manual P. adds the technical information to make sure that the customer's network is always operational and that you always have a fail-safe way to roll back to the original configuration if there are any problems whatsoever. You should be able to recoup the price of this book easily in the first project in which you follow this book's checklists. If you religiously follow his 'Document Everything Every Time' mantra, you will instantly have a successful SMB IT consultancy." "This is a great book. I ended up buying the migration book and the documentation book. The books lay it all out in a straight forward manner and make it easy to implement. I have my own small business consulting company and I have incorporated the network documentation in with my current document process to make it even better. Awsome! Thanks." 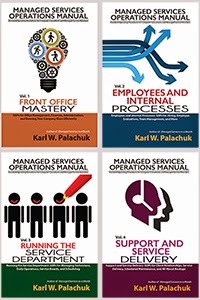 "Karl Palachuk is an author to watch in the SMB IT Consulting space. His previous books have helped our IT business, and this book... actually blew them all away. Chock full of practical advice from real-world experience along with pages and pages of rubber-meets-the-road checklists, this book has helped our business "McDonaldize" (think eMyth) our process of network migrations. If you don't have a network migration strategy or would find value in comparing yours to the way a leader in this industry runs these types of projects, buy this book. It may look expensive, but it's really nothing compared to the value of our time and professional rates, and compared to the time it would take to assemble this kind of information. Hats off to Karl, great job! Keep them coming!" 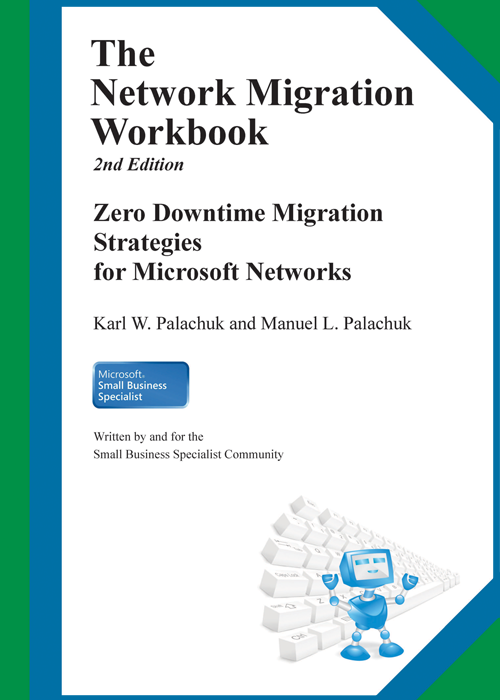 "This book is a phenomenal resource for network migrations. Karl's writing is always crystal clear and concise. The material in this book has been laid out perfectly. 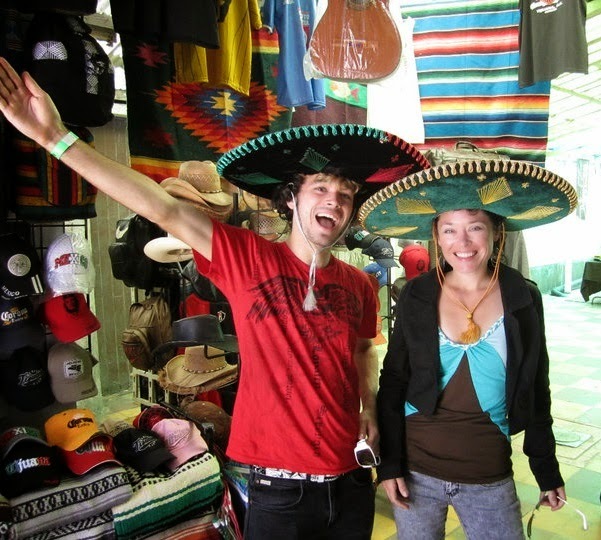 Background information to understand the unique small business environment is ample. I've read Karl's blogs for some time and listened to him on his soapbox over and over again about CHECKLISTS. The checklists in this book are worth far more than the price of the book." Got some great tips from the book, and know where I can tweak Karl's ideas to match how our organization works and have the process 100% documented in probably just a couple of hours if I just stat down and did it. I could confidently give this to a lower-level tech and sales person, let them run with it and expect minimal questions-many tasks are detailed down to the commands you would type in (which need slight tweaking of course for your particular site). All in all, an excellent buy for anyone looking to document your migrations (you should be!) and to put some standardization to the process so less things slip through the cracks! Keep 'em coming, Karl! (Oh, check out his Blog too)"
"Very happy with this book. At long last some easy-to-follow procedures for our little IT-shop. We have migrated our own network using the procedures in this book; we did a Win2000 server-based network migration; and we have installed a Terminal Server for a LOB package to integrate into an existing SBS2003 network. We have chosen not to follow every single procedure to obtain a completely zero downtime migration / installation, as a little downtime is not very critical to our typical customers. But still the book is terrific, and if our customers were larger with a more complicated setup, we would certainly use the very thorough procedures. Anyway I feel this book certainly has taken taken our professionalism to a higher level." "Well what can I say.. Karl has done it again with the Network Migration Workbook.. and as the name suggests.. its a workbook. If you follow the book step by step you can have a very successful Network Migration. All the forms and procedures are in this book and as a registered owner you can download all the electronic versions of them too. If you want to learn how to do Migrations correctly the first time, then this is the book to get." "After purchasing/reading/listening to and using loads of Karl's previous work, the minute we received the email about pre-ordering for this workbook, I made the order. Not only did it have everything I expected from Karl, it had a whole lot more. We had just finished a migration of 2 servers and 20 workstations the week before and we were hanging out for this book to arrive before then. Unfortunately for us it didn't arrive in Australia in time. The good part is as soon as it did arrive and we did a good look through, a lot of the procedures Karl uses are what we went through, so I know we are on track with most of our practises. The bad part is that there are thousands more little snippits of information that we could have used on this migration to save us some time, standardise the installation and DOCUMENT it much better. We literally can't wait for our next migration so we can put the book to 100% good use. Even if you have an internal checklist for migrations and documentation, you cannot afford to NOT buy this workbook. I can't recommend it highly enough, the small amount of money will more than pay for itself on your next migration and will leave your customer much happier than if you didn't use the book." I have some exciting news that will help you take your business to the next level, and it won’t cost you a dime! Did you know that Microsoft Office 365 is the fastest growing product in Microsoft history? As you know technology trends continue to move quickly and it is hard to stay up to date. Let us help you get the on the cutting edge of Office 365 by attending the Office 365 Tour. The Office 365 Tour will give you the skills you need to make your business technology thrive. 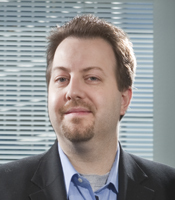 Join SMB Nation and your peers for a focused one day event on Office 365 in 2015. Be sure to check out our event finder for a city near you. If you don’t see a city near you be sure to let us know you would like us to bring the show to you by requesting an event, located at the bottom of the event website, or reply to this email. I'm sure you've heard of a "sales funnel." The basic idea is that you have a large mouth at the top of the funnel and your prospects enter there. With each stage of the funnel, a certain number of prospects get weeded out and the rest remain in your funnel. 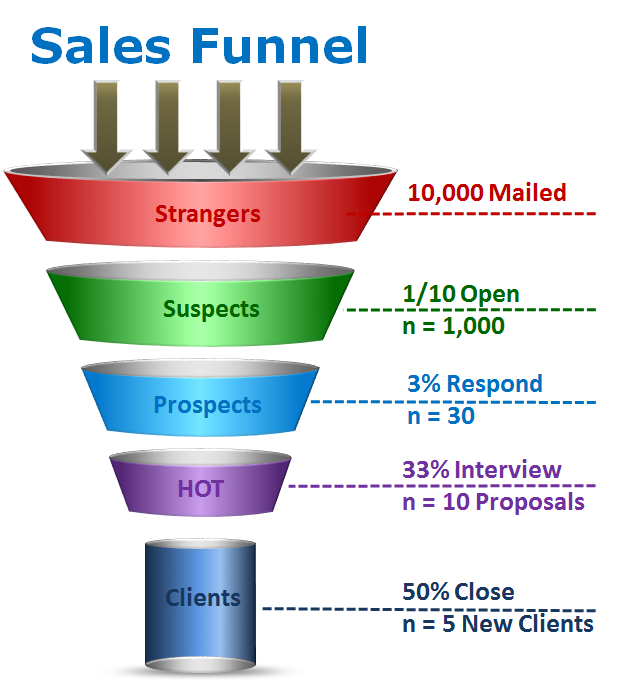 The funnel starts out large at the top, but gets smaller and smaller until just a few people are left at the bottom: Your new clients. Over time, if you have a well-defined sales process, you should be able to generate some average statistics that give you a sense of what you can expect from your sales process. In this case, you start by doing a mailing to 10,000 "stranger" prospects. Historically, 10% will open that mail. So now your funnel narrows to 1,000 prospects. If you have a 3% response rate, 30 of those people will respond to your mailing. You will be able to "interview" and make proposals to one third of these, on average. That brings you to ten hot prospects. And if you close half of them, you'll have five new clients. Let me start by saying that just about everything about the classic funnel view of marketing is accurate. If your marketing is always changing, the percentages will change over time. But if you HAVE a process and you FOLLOW your process, you will know how much effort and money it takes to get prospects through the funnel and get new clients. When you hear people say "It's a numbers game," this is what they mean. Notice also the labels attached to each stage of the process. The classic funnel takes "strangers" and introduces them to you company. Eventually, if they do what's expected and you do what's required, then a few of them become clients. This is where the classic funnel begins to fall apart. I propose a different view of the world of marketing. It assumes that you are not always marketing to strangers. In the classic funnel, the assumption was that you would start with people who had no connection to you at all. This would be a list your purchased, or a broadcast medium such as a newspaper or radio ad. The classic funnel also assumes that you control the entire process of squeezing down strangers into suspects, prospects, and clients. But that is rarely the case today. Today we have to operate at many, many levels at once. For example, you might have a social media campaign across Twitter, Facebook, LinkedIn, your blog, your Pinterest, and you email list. You could easily have "connections" with 10,000 people across all those media. And with their connections, you might potentially touch another 100,000. The numbers get very big very fast. ... and they're not strangers. A) Mailing. Call to action is request a network checkup. B) Get them to open the mailing. Might take three tries. C) Prospects request checkup. Schedule the checkup. Schedule Followup. D) Present results . . . and a proposal for managed services. Steps "B" and "C" are very difficult here because these people really are strangers. In the classic model, these people have never heard of you or your company. The first introduction is a letter asking to engage in work. Yes, you're offering a freebie. But they know the goal is a sales meeting. In the world of social media, you have many more friends and friends-of-friends to market to. AND it's much lower pressure. AND you might actually make some real friends in the process. 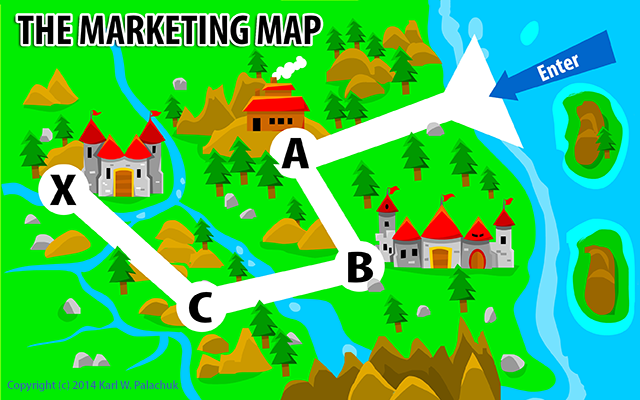 Let's look at this process from a more modern point of view: The Sales Map. With a sales map, you establish a path for prospects to follow, but you acknowledge that they might enter at any point in the process. It's also clear from the start that you don't control most of the process. So the funnel goes right out the door. Think about a social media campaign. Someone might be connected to you Facebook and LinkedIn. You would like them to go to your blog and potentially check out your web site. On your web site you have lots of opportunities to request a network checkup. Then you run a contest to get people to "like" your Facebook page. Maybe you give them a coupon or get them involved in local charity event that's unrelated to work. Once they are connected and engaged with you online, the likelihood of connected in other ways goes up. The point is: You might like to control the order of the process, but you recognize that you can't. And you might even want to calculate some nice probabilities, but you can't. People engage - and disengage - as they see fit. The best you can do is to be engaging! B) Also connect on Facebook. C) Like our Facebook page. D) Join our contest: Therefore visit the blog. E) At the blog, see an offer. F) Go to the web page and fill out the form. G) Schedule the checkup. Schedule Followup. H) Present results . . . and a proposal for managed services. BUT it's just as likely that folks started on your blog, connected on Twitter, wandered over to Facebook, connected on LinkedIn, joined your contest, and DIDN'T fill out the form. But, at some point over the next few months, that new connection engaged at a higher level on Twitter (of FB or LI or whatever), and developed a generally positive impression of you and your business. ... And on the day they needed help with their network, you were top of mind! They might have filled out the form. Or they might have sendtyou an in-Mail or FB message. Whatever the case, they engaged you when they needed help. This model is very messy and hard to control. But it's much more realistic. Your map won't have three or four stops on it. It will probably have fifteen or twenty. People can engage at any point in the process and engage at many different levels. Your challenge consists of always pointing them to more and more engagement. You might still have (you should still have) mailing campaigns. In addition to that, you will now have a never-ending "presence" on social media. None of this is difficult. But it IS never-ending. You have to always keep promoting your business. That hasn't changed. HOW you promote your business and guide clients to engage with you has changed significantly.